In the twelve months preceding July 2010, amidst all the traveling, teaching and performing, the outstanding experience for me was the OSA convention held in San Francisco. This event, which marked the 41st annual edition of the culture fest organised by the OSA (Orissa Society of Americas), was held between July 2nd and 4th - an impressive display of talent and its vigorous expression: spanning three full days, the Oriya diaspora in the USA demonstrated yet again that their cultural roots have been firmly transplanted in the country of their domicile and have flowered into a beautiful and self-sustaining entity, which never fails to amaze and inspire all those who have witnessed the festival over the years. Including me. 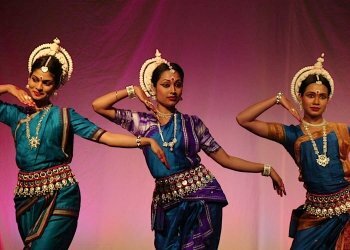 This year's edition showcased a variety of activities that the Oriya community has nurtured within itself – drama, singing, folk and modern dances, and the festival's crowning glory -traditional Odissi dance. Also on show was a film titled 'Jianta Bhuta' - a moving tale about tribal exploitation. 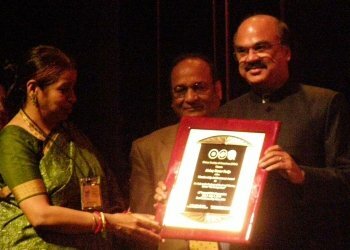 The festival was flagged off at San Mateo Performing Center, San Francisco, on the morning of 2nd July 2010. The Orissa state was very well represented. In fact, a veritable array of Ministers from Orissa had made the effort to be present throughout - Debiprasad Mishra, Minister, Culture, Tourism and Higher Education, Suryanarayana Patra, Minister Revenue and Disaster Management and Ramesh Chandra Majhi, Minister, IT, Science and Technology. Accompanying them was Ashok Panda, Member of the Legislative Assembly from Bhubaneswar. Culturally speaking, the truly stellar presence was that of Debdas Chhotray, the Vice Chancellor of newly formed Ravenshaw University, himself a reputed and much adored poet and lyrist and the son of famed litterateur Gopal Chhotray. Also gracing the occasion with her charming presence was the affable and articulate Susmita Thomas Ganguli, India's Consul General in SF. The OSA was represented by President, secretary, convener and co-convener. Always an eloquent speaker, Orissa's culture Minister Debiprasad Mishra expressed heartfelt joy at the success of the Oriya community in the USA and the commendable efforts made by it to keep the rich Oriya traditions alive and prospering. The address of Kuku Das (convener of OSA) was noticeably warm in its welcome, and set the tone for the faultless hospitality accorded throughout the 3-day fest. Prasant Nanda, the director, and Akshya Parija, the producer of the above mentioned film 'Jianta Bhuta' were felicitated on the occasion. Nanda is a well known thespian and director of Oriya films. Parija has been involved professionally in banking and is widely recognized as an enthusiastic supporter and sponsor of Odissi dance. After the inauguration ceremony, the cultural proceedings turned out to be, what I can describe as, a veritable extravaganza covering a stunningly wide range of items including Odissi dance, Daskathia, Bande Utkala Janani, Chhau dance, Ghumura dance, Sambalpuri dance and Ghoda nacha. There were more than 50 participants consisting of children, women and men; the sheer size of the participation speaks volumes not only of the enthusiasm of the Oriya community for its cultural roots, but also the diligent efforts put in by the OSA organizers and the trainers. For me this was a pleasing and encouraging sign that the future is bright for the dissemination of Oriya cultural forms. An item 'Kuanra Punei Janha go,' an adaptation of the most popular traditional festival songs of Orissa (rendered by the community on the Kumar Purnima day), was performed by a group of Oriya ladies. The song immediately evoked images and memories of rural Orissa and its beautiful ethos even now palpable throughout the length and breadth of the State. 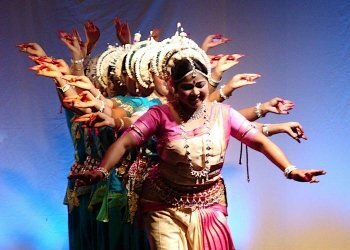 Another notable performance was by the artistes of Guru Shradha, the Odissi dance institute of San Francisco. 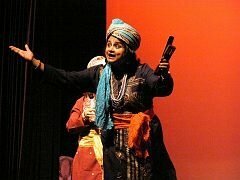 Niharika Mohanty, the Director of Guru Shradha, who trained the group, also performed with them on stage. The item titled Shankarabharana Pallavi was a neat and well executed presentation of Guru Kelucharan Mohapatra's popular choreograph. 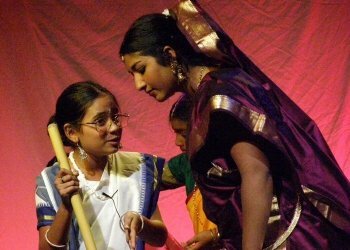 The scene-stealer was an item performed by very young children who arrived on stage immaculately dressed-up as famous Oriya personalities of yesteryears. This moving and innovative presentation by the children represented the following Oriya legends- Phakir Mohan Senapati, Madhusudan Das, Krushna Chandra Gajapati, Utkalamani Gopabandhu Das, Baji Rout, Biju Patnaik, Guru Kelucharan Mohapatra and Sanjukta Panigrahi. Skillfully presented, it brought to mind rich passages of Orissa's history and its adored stalwarts. Touching, heart-warming and deeply emotive. In the concluding moments of the program, all the participants gathered on stage and greeted the audience. Positioned at two ends of the stage was the Indian tricolour and the American Stars and Stripes, the flags strongly symbolizing the historical ties of friendship and the burgeoning cross-cultural opportunities of the future. An important feature of the second day's program was a solo Odissi dance recital by noted male dancer Rahul Acharya from Bhubaneswar. 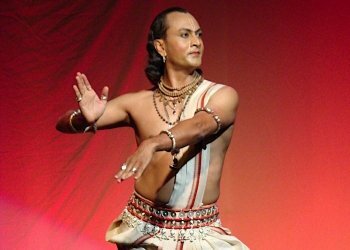 He gave a fine exposition of Odissi solo dancing in an item titled Shivastaka. I have been witnessing consecutive performances by him in the last two years and it is heartening to see his confidence and progress in both style and technical skill. Another good Odissi performance (titled Mahakali Stutee) was staged by the young Pallavi Das who has grown rapidly in confidence and dancing ability. She shows every sign of maturing, with time and experience, into an accomplished artiste. The other performances of the evening were of an appreciable quality that only comes from sustained effort. The day session of the concluding day showcased a rich variety on stage. 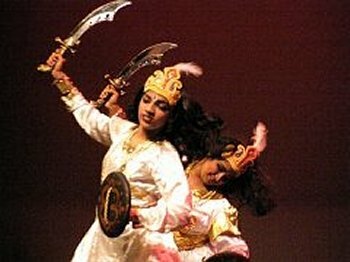 While there was Odissi singing and Odissi dance in a competitive format, there were also performances, both solo and group, in Odissi dance and vocals. Dramatics were included too. Also attractively featured were childrens' performances on the violin, keyboards, tabla and others. 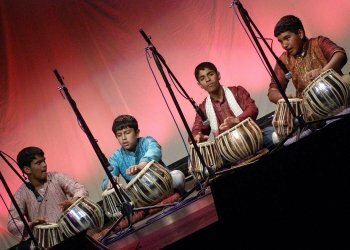 These very young 'exponents' demonstrated not only quality playing but also an encouraging enthusiasm for classical Hindustani music. Encouraging for me, and a large part of the audience, who set great store by our Indian classical tradition. The evening of the concluding day was dedicated to group performances. It opened with a short video documentary on Orissa, prepared by the OSA. 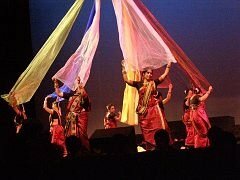 A choral song by female voices was followed by a dance-drama in Odissi presented by five established Odissi teachers of USA and their disciples. Nandita Behera, Jyoti Rout, Niharika Mohanty, the Patnaik Sisters (Laboni, Shivani & Shalini) and Vishnu Tatwa Das were the teachers who jointly participated in the item. While the dancing was generally good and each dancer appeared competent, yet, the level of performance expected on an OSA platform, fell a little short. Matters were not helped by the small proportions of the stage (which was inadequate for a dance drama); more so because there was very little space to accommodate a professional lighting set up which could have augmented a good dancing effort. The sound system, however, managed by the same person who was doing the lighting, was certainly of a superior quality. This was followed by modern and folk dance presentation as well as a comedy show. The grand finale of the three day OSA convention was rendered by Ira Mohanty, the highly popular singer from Bhubaneswar. She regaled the audience with a rich variety of Oriya songs, both films and non-films. The singing was of a high order and the accompanying music tracks were of a quality that ably supported Ira Mohanty's mellifluous singing. All in all, I returned from the festival with a good feeling about the Oriya community domiciled in America. They can certainly be commended for unflagging interest in their roots, in their culture and in the State of their origin. Here, however, there is a 'BUT', and it is not a very small 'BUT'. In an effort to pack in as many skills possible in their children, many Oriya families, I noticed, divide the kids' time equally between classical dance/music and other pursuits, usually a variety of sporting activities. Now, it stands to reason that sustained training in classical dance certainly would require more time on a regular basis for the disciplined child to get infused with the beauty of the classical form. But such time that is available to the child beyond the study needs is being equally rationed out for a diverse range of interests – musical, sports and others. It is my feeling that this shortchanges the child in his/her pursuit of excellence. The hunger for versatility must not eat into the time and rigour that is essential for long-term training in the classical Arts. 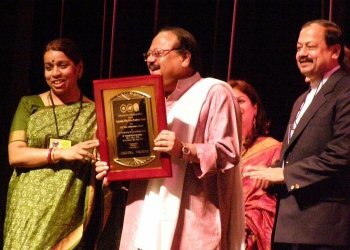 While I, among many others, am very impressed by the Oriya diaspora's devotion to its culture, I do feel that greater attention needs to be paid to those very young minds, who are already on a journey of discovery into the classical traditions of Orissa.